Photo toxicity 101 information for you to absorb and lock away for next Summer. Most citrus essential oils contain a compound called Furanocoumarins or FC's. These FC's like to attach themselves to our DNA and through this action they increase our sensitivity Ultra Violet radiation aka The Sun, that big ball of burning gas in the sky. This results in an inflammation response occurring in our skin that can potentially lead to a rash, skin irritation or full grade burn if we don't practice common sense. If you happened to see that horror story which went viral last year of a woman who used a citrus oil then went to hot yoga and a tanning salon..... you've got ALL the information you need on what NOT to do right there. There are a few anomalies to the 'all citrus oil' contain FC's though so let me break them down for you. Firstly, it's really interesting to note that steam distilled citrus oils do not contain FC's. It's only cold pressed citrus oils which they are present in. Steam distilled citrus essential oils are generally only used by the perfume industry so their customers don't receive an irritation when worn outside. Cold pressing citrus retains all of the aromatic chemical compounds which are highly sensitive to heat. Secondly, Green Mandarin is an awesome citrus essential oil that doesn't contain any FC's at all yay! If you need to be citrus scented all summer long than Green Mandarin is your guy and you simply MUST try it layered with either Jasmine or Whisper for swoon worthy deliciousness. Using products that contain citrus essential oils such as shampoo or soap is totally fine as it's washed off our skin and doesn't have time to fully penetrate the dermal layers. Diffusing citrus oils is A-Ok too, as is ingesting them though I do say that with a little caution as I can only speak from my own experience there. I personally haven't had a reaction through ingesting my citrus oils over summer. There is some evidence that shows eating celery leaves or grapefruit juice which both contain FC's increases sun sensitivity so the theory would go that potentially the same would apply for citrus oils. Lindsey Elmore, Pharm.D., BCPS states “Many essential oils that cause phototoxicity are ingestible citrus essential oils. Does ingestion also increase the risk of sunburn? The risk of skin sensitivity is highest when essential oils are applied to the skin. However, ingesting essential oils brings the same set of FCs, and it is possible that ingesting citrus essential oils can also increase the risk of sunburn. Do what you will with this information. Like I said, personally I haven't experienced any increase in sensitivity but we are all so different biologically that your experience may well be different. Dermal or topical application though is the biggest concern though. If you are aromatically dressing with your oils during Summer and plan a big day in the sun, please don't use a citrus oil OR if you do, please cover up well. It's best to wait a full 12 hours before soaking up some rays ok after applying a citrus oil. 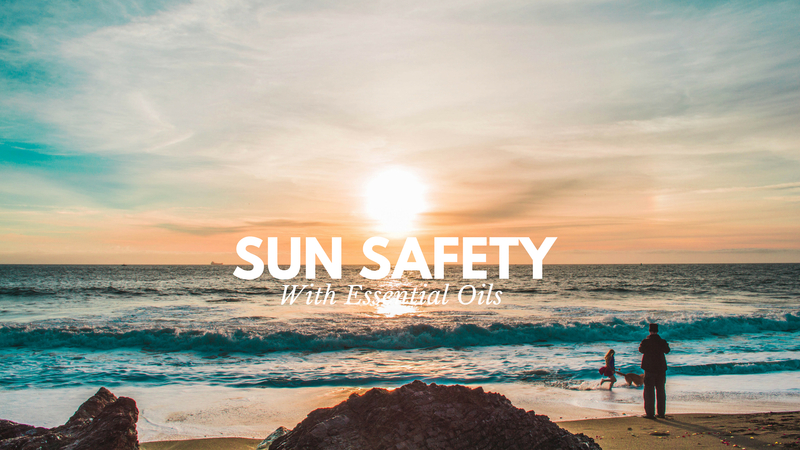 Check the back of your doTerra essential oil bottles if you are unsure for their safety in the sun. 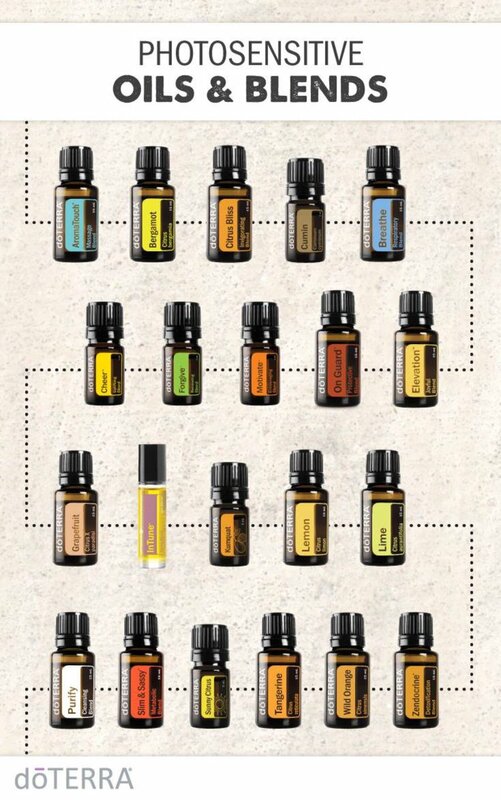 doTerra has labeled any problematic ones with a Sun Sensitivity warning and I've provided you with the full list of the single oils and blends below. I hope that helps you guys and have the BEST Summer ever.